The real housewives of Atlanta star Kim Zolciak have been rumor for various plastic surgeries, many of them she has been confess during interviews and media talks while many of them she keeps hiding to be revealing to the public but one of them incredibly conceal the social media that was her heart stroke on 22nd September. The former Dancing with the stars competitor took to Instagram on 27th October to let her fans and viewers that she is going to get a post operation in order to get recovered from the heart stroke. Well here we are discussing all of her plastic surgeries along with before and after photos. Kimberleigh “Kim” Zolciak-Biermann born on 19th May 1978 at Pensacola, Florida, the United States to Joseph and Karen who belongs to a military family. Kim attended the East Catholic High School and graduated in 1996 and then she took admission at the University of Connecticut for studying nursing. Kim’s career started in 2008 when her appearance came on the surface in the reality television series the Real Housewives of Atlanta on Bravo. Later Zolciak competed on the 21st season of the Dancing with the Stars where she was paired with dancer Tony Dovolani but she withdrew in September 2015 due to health issues as she had a heart stroke. Zolciak married with Atlanta Falcons football player Kroy Biermann and now she is the mother of six. 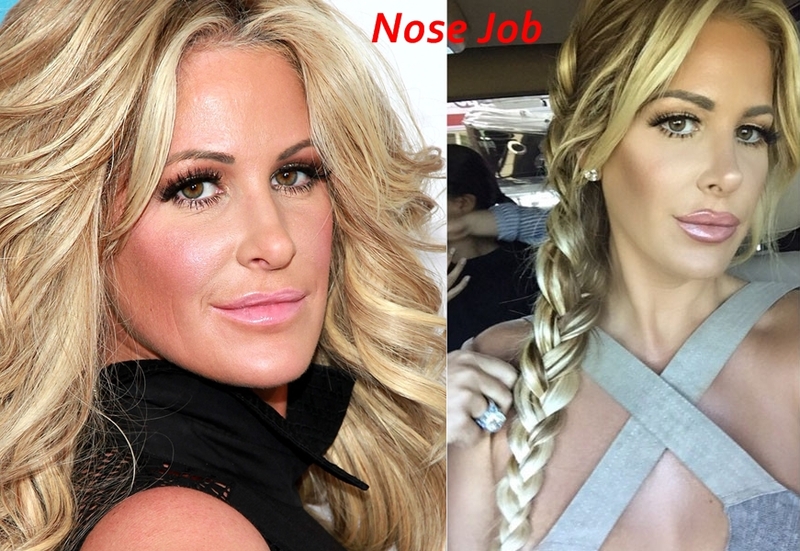 Lately, on 31st March 2015, Kim Zolciak uploaded her side face image on Instagram where her nose was considerably looking altered and her fans comment on this photo as Kim has gone for nose job because her nose tip is looking lightly different then of her before look at the Real Housewife of Atlanta. In August Kim interview with Andy Cohen who thinks Kim Zolciak secretly got a nose job and she asked to her “did you really get a nose job as your nose is looking a little shaved off,” Kim answered “My Nose…..No! She also said I am very honest with plastic surgeries and I never hide if I have something with myself as previously I have a botox and I reveal it but nose, I don’t have any surgery for my nose its natural” so the story is clear with her comments but can you rely on her words if her nose apparently looking different then of the before nose she has. You can see in the following image and can notice that how her downward nose tip is now lifted up and making her nose so pointed and sharper. Its the result of Rhinoplasty surgery that she has not confessed yet the time but as soon as she confesses we will keep you up to date it. During performing at Dancing with the stars Kim gets a heart stroke on 22nd September that’s why she withdraw from the competition and doctors consult her for taking a heart surgery Post Operation. Kim admitted to going under the knife for recovering the heart stroke. The surgery comes just over a month which caused her to temporarily lose the ability to speak but now she is totally recovered and recently she posted her new photo on Instagram and said: “My heart surgery was a success! !” She thanks to Doctors who successfully done it and she said I can’t to be the wait to be back on my feet 100%! 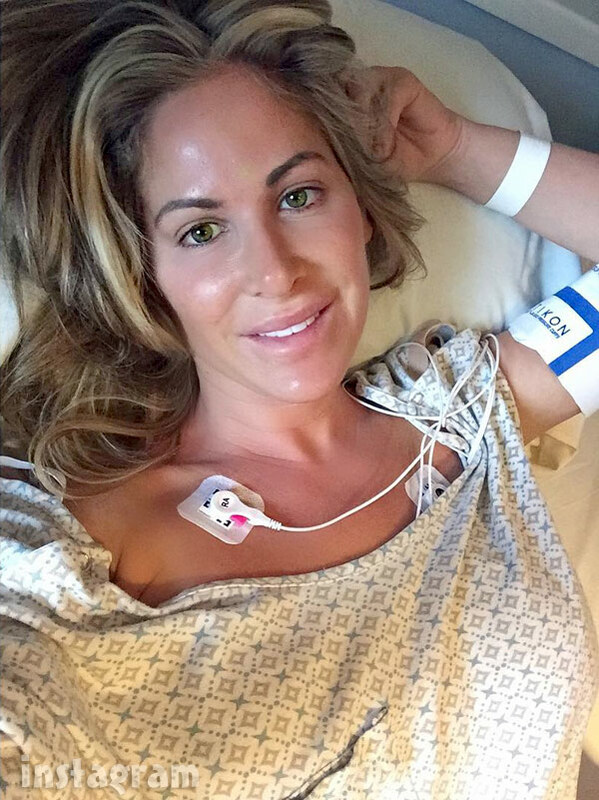 Kim Zolciak-Biermann posts hospital selfie after successful heart surgery you can see below. Hence this is all about Kim Zolciak plastic surgery before and after Instagram photos, we have shared with you and we suggested you be in touch with this page to get any further details about Kim Zolciak plastic surgery along with her before and after photos.